A pair of 70s soul classics from arranger Gene Page – back to back on a single CD! First up is Hot City – an excellent album of Barry White-styled instrumentals – put together by Barry's right hand man Gene Page, and produced by Barry himself! The record's one of the best that Gene Page ever cut – apart from his seminal blacksploitation soundtracks – and it's very much in the mode of White's Love Unlimited Orchestra albums from the same time, although perhaps with less of a string section – and more of an emphasis on funky drums at the bottom. Players are an all-star cast of LA studio groovers that includes David T Walker and Ray Parker on guitar, Ernie Watts and Wilton Felder on saxes, and Clarence McDonald on keyboards – and tracks are mostly originals by Page and White. Titles include "Jungle Eyes", "She's My Main Squeeze", "I Am Living In A World Of Gloom", "Satin Soul", and "To The Bone". 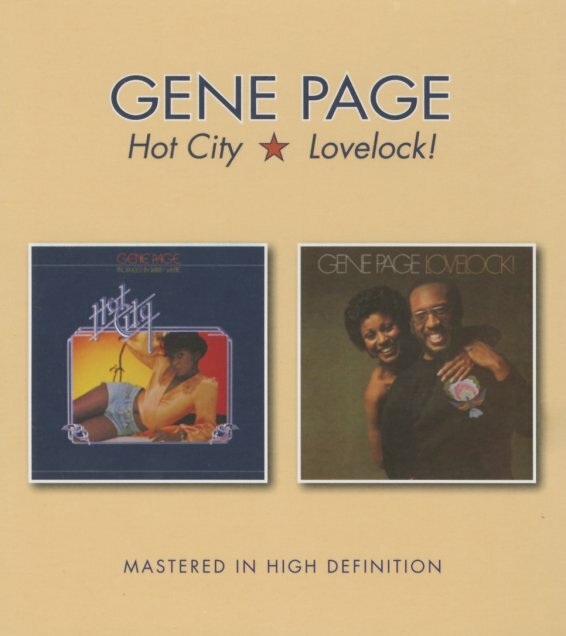 Lovelock features Gene Page at the height of his 70s powers – using all the talents he forged as a background artist for other soul talents, and all the majesty he added to his soundtrack work – all focused nicely into a sweet set of warmly soulful grooves! The style's a bit clubby, but also has some wider depth too – maybe an undercurrent of fusion that comes from players like Lee Ritenour and David T Walker on guitar, Joe Sample and Sonny Burke on keyboards, and Oscar Brasher on trumpet – who find a way to work wonderfully alongside the albums vocals from singers Merry Clayton, Edna Wright, and Jim Gilstrap – all with a style that's not unlike some of the best Quincy Jones material of the time! As with Quincy, there's a sense of care and confidence that really holds the album together – on titles that include "Higher My Love", "Organ Grinder", "Into My Thing", "Wild Cherry", "Fantasy Woman", "Straw In the Wind", and "Together Whatever". © 1996-2019, Dusty Groove, Inc.